At the Courts at Mayo Clinic Square, Janel McCarville is ready to sit down. Having just completed a three-hour practice, the Lynx finished their morning with a grueling conditioning session. McCarville paired up with Sylvia Fowles, pushing through a series of drills that included resistance bands and individual leg squats that looked exhausting even to watch. After a season off from the WNBA, McCarville is making every practice count. She was allowed only two days to get up to speed upon returning from overseas, where she played in the Turkish women’s premier basketball league (KBSL) in Kayseri. There are new plays to learn and new teammates to get to know. 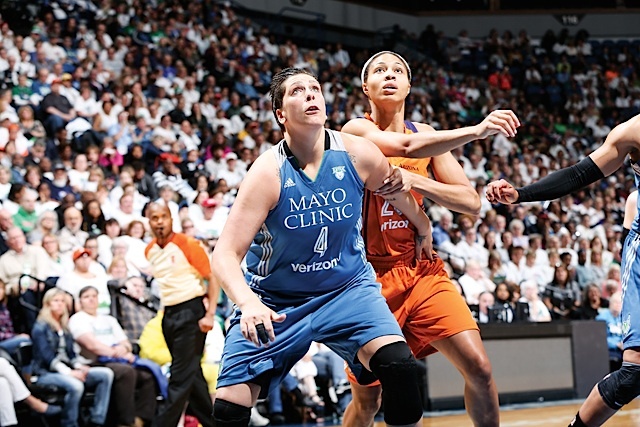 Questions swirled last summer when the Lynx announced McCarville wouldn’t be playing. Was she hurt? Or, like Diana Taurasi of the Phoenix Mercury, was she saving herself for a more lucrative overseas league? Seeing her sitting courtside at most Lynx home games last summer prompted excited chatter amongst the fans, who wondered about her presence in a chair and not on the court. McCarville says the wear and tear of over 10 years of playing professional basketball finally caught up with her. Staying healthy is McCarville’s biggest challenge at this point in her career, and requires continuous extra effort. Post-games, while everyone else enjoys celebratory beers or goes home to rest, she’s spending extra time working out her back and hamstrings. This may be part of the reason why she’s comfortable in her new role as support for starter Sylvia Fowles and Rebekkah Brunson. She’s prepared to step in when called upon. After her summer sabbatical, McCarville made it clear that the Lynx were the only team she’d consider playing for. Not only did she have loyalty to the team with whom she’d won the 2013 WNBA Championship, but Minnesota is closest to her hometown of Stevens Point, WI. It’s obvious from the way she describes her connection to her family and the 160-acre hobby farm where she grew up, with cows, pigs, chickens, ducks, and pheasants, that “home” is a priority. In fact, she was disappointed that an upcoming game would cause her to miss cow vaccinations with her family. Home is where she eventually plans on building a house, on the 20 acres she was given by her parents along with her other four siblings when they divided up the farm. Home is what made her who she is, both the basketball player and the person. Everything she’s learned, even the exceptional passing she’s known for, was self-taught. Without the money for the basketball camps and private lessons so many other pro athletes grew up with, McCarville had to improvise. The Lynx have started the season strong, and McCarville already has the start of a 2016 highlight reel, with a falling-to-the-ground, behind-the-back assist to Renee Montgomery making the rounds online. Google it. The play almost rivals the 2013 finals highlight of McCarville running out of bounds, and passing behind, no-look, between-the-legs to a teammate for an easy layup. Awareness is instinctual for her. In addition to being a positive presence on the court, McCarville, who is gay, also has been a positive influence for the GLBT community just by her mere openness. She considers herself active in the GLBT community, though not an activist. GLBT Lynx fans have long cheered extra loud when she plays. McCarville herself is a little oblivious to the attention. Her approachability has led to a healthy Twitter and Instagram following and she says she always attempts to respond. Certainly she’ll gain plenty of new followers this season, especially during Pride week. By the way, she’s single. Good luck, ladies. And you better like farm animals. J Mac upgraded her seat and is in a great place. Love to see that happen for her. Welcome back, JMac!